Welcome to the first installment in what will hopefully be a well-received and mostly enjoyed part of the blog! Let me begin by stating that I am not a professional brewer. 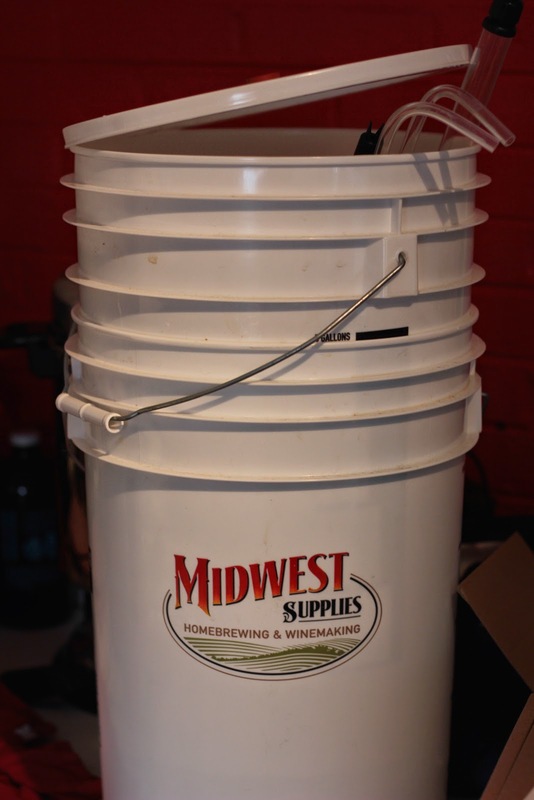 I'm just a guy with a couple of five gallon buckets, a plastic carboy, and some assorted brewing equipment. I also enjoy beer, understand the basics behind brewing, and know how to read. If you don't currently possess these qualities go do a few minutes of Googling and you'll be caught up. So, you need water, malt, and hops to make beer- seems simple enough, right? Well, it is...until you start trying to decide which malt you want, which hops you want for your aroma, flavor, and bittering, or what type of yeast strain you want. Also, if you brew and find unfavorable results it could be from anything from improper sanitation to hard water to not cooling the beer quickly enough. While brewing may seem like a simple prospect it can get incredibly confusing very quickly. Primary Fermenter, bottling bucket, pipes, tubes, and thieves. Let's begin by looking at my setup. The first photo shows what looks like 4 buckets stacked on each other. In reality it is two but they both have a lot of ridges. If that confuses you then I'm sorry. Inside are the rest of the pieces that came with my brewing kit; a pump for transferring from the primary to the secondary (or bottling bucket), some clips for tubes, a barrel thief (for taking a sample of the wort for testing with the hydrometer), a hydrometer (for finding the gravity of the beer while brewing to determine ABV), tubes, a paddle, a bottle capper, and then some various things I've picked up since I began brewing. Brewing can become something really complicated if you let it, but it can also lead to a great way to test out ideas or eventually a business if you put the time in! Tallgrass Buffalo Sweat Stout Partial Mash Kit. There are multiple types of kits you can purchase that require different equipment, time requirements, and knowledge of the process of brewing. Extract brewing is really easy in that you just pour your ingredients in a pot with water, bring it to a boil and make sure it doesn't boil over. After a bit you add some other ingredients in, boil, add hops, let boil for awhile (usually about 45 minutes), add more hops (for about 15 minutes), then some other hops for maybe the last 5-1 minutes of the process. Then you cool it quickly, add water, and put in your primary fermenting bucket. Add yeast, cap, and airlock, and go! Laptop and Bluetooth speaker for entertainment during the boil. The kit pictured here is a partial-mash kit which is a great step between extract brewing and all-grain brewing. You still use some extracts (this one used some light malt extract for example), but you also move one step closer to an all-grain brew in that you essentially steep your grains in water and then sparge the grain (pour hot water over them) into the pot to finish creating your wort. All-grain brewing is the real deal. Grains are dried and crushed, malt, and hops too. Real deal brewing. As I said before, each step requires different equipment, so before you buy a kit make sure you have what you need or it can become very pricey! Read the directions before you brew! This will keep you from having any moments of panic. Sanitizer in the sink! Make a bunch of it because you'll need it! Think you'll need it? Sanitize it! Keep a notebook that you can write in. Add problems you had, how long it took to get the wort to temp, to cool, etc...the more notes you keep the better you can analyze your process and make adjustments. Enjoying beer is an obvious prerequisite for enjoying homebrewing, but make sure you don't get too sloshes before or while you brew or it can get...weird. Does that mean no drinking while you brew? Hell no! Just don't go crazy. While your wort comes to a boil, and the boils with hops, you will be sitting and waiting for a long time. I recommend not leaving because that is when boil-over happens which is a waste and would be difficult to clean. So bring a book, a laptop, a phone, ball-in-cup, something to keep you from sitting and watching water/ wort boil! That's it for the first installment! I don't want it to become too overwhelming, and obviously there is a lot to talk about. If you have questions or comments ask away in the comment section, email me at James@virginiabeerblog.com, send us a tweet, Facebook message, Instagram, whatever! Labels: beer, brew, home, homebrew, James.